This news comes as a gigantic shock and can be categorized in the "I can't believe it" file, but regardless of my appauled opinion, Blade director Stephen Norringon is developing a prequel trilogy to the Blade films focusing on vampire Deacon Frost. Mania confirms the news of a new spin-off trilogy focused on Frost which would begin production after Norrington finishes remaking The Crow. 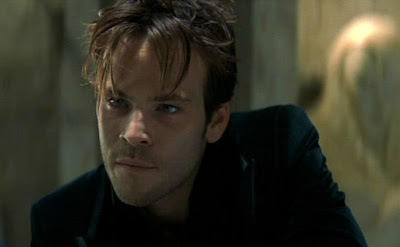 If you don't remeber the character of Deacon Frost from the first Blade film, Frost was played by Stephen Dorff and was the lead villain. Frost died at the hands of Blade at the end of the first film, (hence the prequel storyline). Stephen Dorff told the Sunday Mail, "It will be a prequel to the Blade movies, Deacon's story. It's a new trilogy the director has created. It will be cool." Director Stephen Norrington confirmed Dorff's comments and added that Dorff came up with the idea on his own by saying the idea, "has evolved into a very interesting story." I am completely against this idea. First and foremost Deacon Frost was not even that cool of a character in the first place. He probably is my least favorite aspect to the original Blade film. A character that I felt could have been either, better performed by someone else or written entirely different. What really gets me scratching my head about this news, is the trilogy aspect. Does anyone really need to see 3 films solely telling Deacon's story leading up to him being sliced and diced by Blade? I have a ton of further questions including, would any studio actually back this project? Is Stephen Dorff actually a bankable commodity anymore? What the hell is so interesting or different about Deacon Frost from any other vampire antagonist that we need to suffer through three prequels? Would this new trilogy be anything other than a direct-to-dvd series? Lastly, I am completely flabbergasted that anyone is actually interested in this idea other than Stephen Dorff. Luckily the idea will have to sit for while Stephen Norrington ruins The Crow.